Does your client owe the principal or principle? Is your company moving forwards or forward? Do you have over ten years’ experience, or more than ten years’ experience? Proper use of the written and spoken word determines whether or not you move ahead in your career. 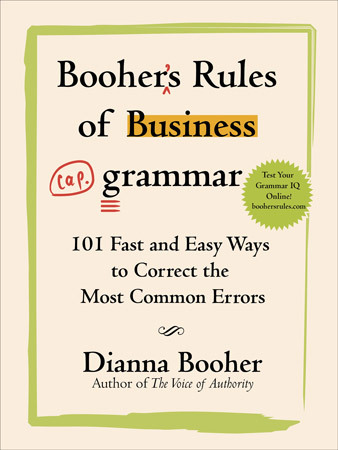 In Booher’s Rules of Business Grammar, business communication guru Dianna Booher identifies the top 101 mistakes made in emails, presentations, and conversations every day. She briefly examines each one and explains what you need to know in order to avoid future mistakes. In addition, Booher includes effective “memory tricks” to reinforce comprehension and retention. Master the language—so you can focus on your business! Whether you decide to skim it and correct a mistake a minute or read the whole book in a couple of hours, use Booher’s Rules of Business Grammar to set yourself apart as an expert communicator. Speak and write like a polished professional with Booher’s Rules of Business Grammar. Dianna Booher nails it! The Memory Tips alone are worth the price of the book. This one’s a gem. Dianna Booher pulls off a deft and most impressive feat: In writing about tight, top-flight grammar, she shows those very same skills in abundance. This book seems to be most useful as a desk reference for individuals, but it will also be of interest to public libraries with collections that support career development.